Today I just wanted to point out that just below the photo for each days Post there is a tiny word “comments”, if you click on that you have the opportunity to leave feedback, share your stories or even mention an area of decluttering you might like help with. I would love to hear from you and appreciate your tips and views. Yesterday I had a comment from Janetta who has been inspired to start decluttering again. She is even reducing by a bag of things some days because they are only small items. As I have said before “Every Little Thing Counts” whether alone or by the bag. Below is a list of small thing that I used today to make a Reusable Car Bingo Game for my niece and nephews. These were all excess items and resources taking up space in our office/craft room. The screen protectors were from a laptop we no longer have. The whiteboard markers were from a stockpile no doubt at risk of going dry and useless in the drawer waiting to be used. I am sure the kids will be thrilled with the result and I am happy to have purged yet a few more things. 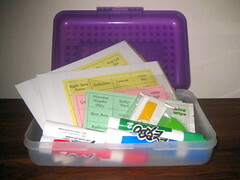 Here is the photo of the Bingo Game I made for the kids. I really enjoy your blog. I took your 365 thing challenge and have already hit 416 items gone and it is only April 22nd! I think I’ll go for 500. Well done Betty. It is amazing how much stuff we have that is just a waste of space. It feels so good when it goes though doesn’t it?